Congratulations on deciding to become a beekeeper! You’ve got a fascinating experience ahead of you. To ensure you’re fully prepared, we’ve created a checklist of the seven most essential beekeeping supplies for beginners. 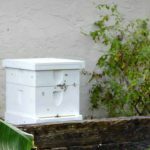 Besides your bees, these are the things you’ll need to make your venture into beekeeping a safe and successful one. The most typical hive box will hold ten frames, and boxes can be stacked as needed to increase space for the bees. The frames are constructed so that they leave the necessary bee space between them when hung in the box. This allows the bees to pass easily between the combs they create on each frame. The greatest advantage of the Langstroth hive is that the frames are removable. This allows for quick and easy inspection of the hive for diseases, infestation of predators, and other problems. The frames can also be rearranged within the hive to maximize the bee’s use of the interior hive space. Additionally, the frames, in most cases, are built strong enough to be spun in a centrifuge to extract the honey. The centrifuge extraction method leaves the combs intact so that they can then be returned to the hive. 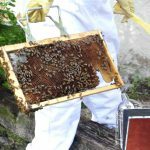 Since the bees will not have to expend time and energy rebuilding the combs, they will be able to produce the next harvest of honey more quickly, increasing the overall yield of the hive. The second most important beekeeping supplies for beginners is a good quality Beekeeping Suit. A beekeeping suit is full-body protective covering that helps keep you safe from stings. It is constructed of a heavy-weight material that helps keep stingers from reaching your skin. 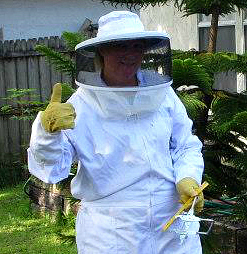 Beekeeping suits are plain and light-colored so that the bees will not confuse the keeper with a predator to be attacked or foliage to be investigated. The body of a beekeeping suit will generally have a long zipper to make it easy to put on and take off. The cuffs of the legs and arms will be elasticized and should fit snugly. This will keep bees from entering the interior of the suit through gaps in the wrist or ankle areas. Since guard bees are drawn to human breath, the most important element of the beekeeping suit is the hat and netted veil. Bee stings to the face and neck are the most dangerous and painful, so it is vital to protect your head and neck. Some beekeeping suits have zippers and/or Velcro with which to attach the veil to the shoulder area of the beekeeping suit. This creates a secure enclosure for the beekeeper that the bees cannot enter. The fully-secured hat-veil-suit combination provides the greatest protection to any beekeeper and provides new beekeepers with the greatest peace of mind when learning to work with their bees and hives. Beekeeping Gloves are another important part of a beekeeper’s protective wear. Your beekeeping suit may or may not come with gloves. If it does not, you will want to be sure to purchase them separately. Beekeeping gloves, like the beekeeping suit, is made of heavier, light-colored material. Usually the gloves will reach up to the elbows. The length of the glove combined with the beekeeping suit’s elasticized wrists make it nearly impossible for a bee to make its way to exposed skin inside the gloves and suit. It is important that your beekeeping gloves fit well. Properly-fitted gloves make it easier to work smoothly with the hive box and frames. Clumsy, clunky movements caused by wearing over-sized gloves can anger the bees and cause them to become agitated with their keeper. And a poor grip can lead to dropped frames which can kill your bees and/or damage the honeycomb. Well-fitted beekeeping gloves provide important protection for both you and your bees. Beekeepers use smoke to calm their bees before opening and working within the hive. A good Hive Smoker is essential to this process. To the bees, where there’s smoke there’s fire, so they turn their attention to feeding to build up stores of energy in case they need to abandon the hive. Additionally, the smell of the smoke masks the alarm pheromones the guard bees produce when they sense the hive is under attack. These two situations — preoccupied bees and suppressed pheromones — create the safest environment for beekeepers to inspect their hives. Hive smokers today are designed for both the safety of the bees and the welfare and efficiency of the beekeeper. For the bees, the hive smoker produces a cool smoke that doesn’t burn their bodies or combs. For the keeper, the modern-day smoker has a protective heat shield to prevent burns and a hook to keep it handy and hung away from any flammable material in the area. The bellows make it easy to ignite the natural materials being burned and to disseminate the smoke over the hive. A good-quality smoker makes hive inspection a calmer experience for both the bees and the beekeeper. A Bee Tool is simply a flat, metal bar that helps the beekeeper gently separate the hive frames for inspection. If the tool is hooked on one end, it can also assist in lifting the frames from the box. Bee tools are usually made of steel and vary in length to accommodate different styles of hives, sizes of frames, and beekeeper preferences. Often they are painted a bright color to keep them visible and make them harder to misplace. A Frame Gripper is a large tong that makes lifting individual honeycomb frames from the hive safer and easier. A frame gripper keeps the beekeeper’s hands away from the honeycomb frame and the hundreds of bees working there, thereby reducing the risk of stings. It is also designed with hooked ends to hold each frame tightly and securely, which means frames are less likely to be dropped and damaged during inspection. The last of what we consider the seven essential beekeeping supplies for beginners is a Bee Brush. A bee brush is made up of long, soft bristles that can be used to move bees without harming them. 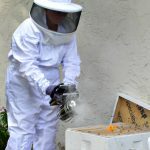 Bees can be safely brushed from areas of the hive box where they otherwise might be injured or killed when reassembling the hive box after inspection. A bee brush also helps remove clingy bees from your beekeeping suit before you move indoors. A bee brush allows you to maneuver a number of bees quickly and easily with minimal agitation. Once you have acquired these seven essential supplies, you will have everything you need to make your beekeeping experience a safe and enjoyable one. All that’s left is to get your bees and begin. Welcome to the world of beekeeping! Do you have a comment or question? If so, we’d love to hear from you! Please leave your question or comment in the box below.